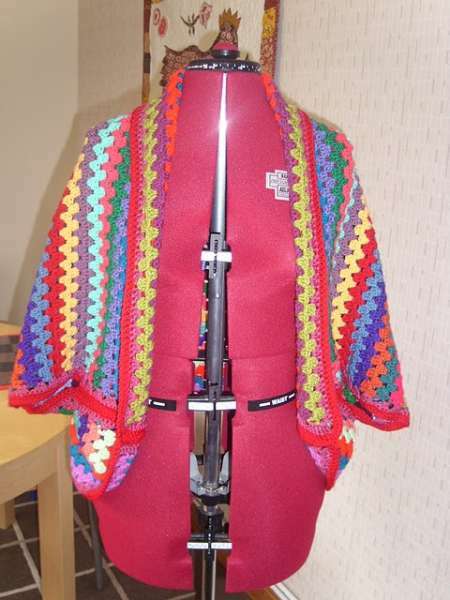 This is one of the ‘happiest’ shawls I’ve ever seen! It’s a great scrap yarn project. Of course, what’s really informative here is the ‘assembly’ technique. Who’d thunk it could be so easy?? Check it out here. Scroll down for the ‘tutorial’. Some people just have a sense of design (not to mention color) that I lack. Some will think I’m easily impressed. Well, that may be. But, I’ll be making one of these. Would work equally well with a single color of yarn too – or even squares or other motifs. Looks like Joseph’s Amazing Technicolor Coat! Please let us see when you finish yours. What a great idea. I would make mine with monotone colors, not so bright is my preference. I would love a pattern for this, does anyone have some ideas? Pretty wrap! I love patterns that use up all the scraps one doesn’t know what to do with. That is an excellent way to go: saving and satisfaction!